Fall of 2014 is a busy one for us at the Bowmont Motel in Penticton. We are in the midst of a huge renovation to our pool and courtyard area. Whether its swimming in our heated pool, suntanning in a lounge chair on the pool deck, watching your children make new friends on our grass courtyard area or barbecuing your family dinner, we want to provide you with the best possible experience. Stay tuned for future progress photos. Please feel free to leave a comment if you have any questions or feedback about our renovations. 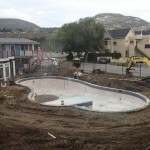 This entry was posted in Latest News and tagged pool renovations. Bookmark the permalink.